Edward Elgar was hardly a "one-hit wonder" (despite his "Pomp and Circumstance" march, heard at every high school graduation). Among his other compositions, Elgar's "Enigma" Variations holds an over-sized position among the all-time favorite symphonic works. Tito Munoz, assistant conductor of the Cleveland Orchestra, made a trip down I-71 to lead the Cincinnati Symphony Orchestra in a vivid and deeply felt performance of Elgar's iconic work December 4 and 5 at Music Hall. It was a return visit for Munoz himself, who was assistant conductor of the CSO during the 2006-07 season. 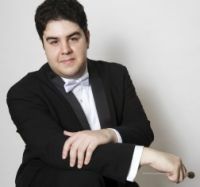 Just 26, Brooklyn-born Munoz is well on his way to a major career (he is currently one of seven candidates for music director of the Hartford Symphony). He leads with authority and presence, while communicating a natural empathy with his players and a deep involvement with the music. Named for the very spot Copland visited with Mexican composer Carlos Chavez, "El Salon Mexico" is a remarkably complex piece that weaves together a half-dozen authentic Mexican tunes while managing to deliver irresistible rhythmic vitality and genuine lyricism. Munoz captured all of that in the work's scarce 10 minutes, which featured associate principal clarinetist Jonathan Gunn in about the sassiest E-flat clarinet solo I have ever heard. Fliter, stunning in a glittery beige gown, is a Chopin interpreter of the first magnitude. This was clear from her first entrance after the lengthy orchestral exposition where she drew a rich, satiny tone from the keys. Chopin's often florid passages emerged with crystalline purity enclosed within an overall stately concept that somehow elevated the composer even more. Integral to this were Munoz and the CSO, who supported her fully. A bit of unscripted cell phone disturbed the opening of the second movement Romanze, which featured beautiful interplay between Fliter and principal bassoonist William Winstead over muted strings (so much for Chopin's bad rap as an orchestrator). The perky finale brought the audience to their feet and prompted more Chopin, his "Minute" Waltz in D-flat Major, Op. 64, No. 1. 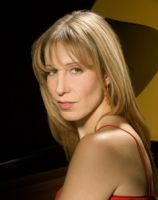 The depth of character in Munoz' "Elgar" was felt in the opening statement of the theme, a gentle, soft-breathed Andante, and was furthered in every variation. The rapturous sudden fortissimo in "C.A.E.," a portrait of Elgar's wife, the perky winds in "R.B.T." (gentle spoof of a friend) and the fluster of "W.M.B.," obviously a man in a hurry. The CSO obliged Munoz with fine playing indeed: timpani and trombones in the Presto "Troyte," which ended with a great orchestral clatter, principal violist Paul Frankenfeld's soulful solos in "Ysobel" and "Dorabella" and principal cellist Ilya Finkelshteyn in "B.G.N.," which featured gorgeous sonority by the entire string section. The shaping and pace of the variations as a whole were superb and distinctive moments were scrupulously observed, as in the "spooky" music of the "Romanza" with its "faraway" (super-soft) solo by principal clarinetist Richard Hawley. The only downer in the entire work was the sound of the tinny Music Hall organ in the finale, "E.D.O." (for "Edoo," Alice Elgar's pet name for her husband). The electronic instrument may cause a rumble in the floor, but remains an embarrassment to Music Hall, which deserves the kind of pipe organ owned by the great concert halls of the world.